Posts: 1434 You'd be fine but take the same precautions as one would in any large crowd of strangers. Tag along with the crowd on here & keep an eye as they finalise plans nearer the time. Posts: 11 Thank you, it will be one of those "growing up experiences", like when i bought my first sofa... come to think of it, that just made me feel old! hang around with me lj - i guarantee to make you feel at least 20 years younger than me ! Posts: 1434 Ere! You have some gossip there Janet! Canada! Bob! You don't actually realise how many people are going on their own, and everyone on her has been v.cool about hooking up with one another. i am getting their on wednesday morning as last year after thursday lunch time is was mental, hopefully a few of us could meet up then, what day are you getting their? Here's last years site map. Where we've camped the last few years has been near the medical tent/ATM next to Pennards, which is the field that has The Park at the top of it. It's next to the train track, it doesn't flood, near the Green Fields & there's a nifty little tea tent nearby as well. I'd suggest that you guys aim for here & use this area as your base. Wed morning sounding good to me, which direction are you coming from? I'm near Milton Keynes. Nice map Mr Mob! Do they tend to keep the layout fairly similar to previous years last V? p.s Monday is officially over, get in! 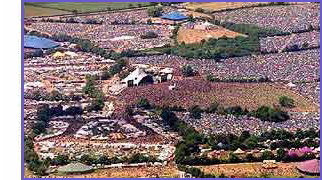 i am driving from south east near Reading, they have put up this years map on the glastonbury website its under fine guide.